Model PV centrifugal power roof ventilators are energy efficient, quiet and reliable fans designed to exhaust clean air from the building through the roof. The aerodynamical design of the air flow passage through the fan yields a signature flow passage characterized by the precise shapes of the venturi impeller inlet, deep formed impeller shroud, three dimensional shape of the impeller blades, and deep formed discharge hood. This unique design yields high energy efficiency of the fan, thus ensuring high air performance and low sound levels. Model PRN direct drive fans are centrifugal power roof ventilators designed for exhausting clean air. Capacities up to 2770 CFM and up to 1 inch static pressure. The PRN is a downblast exhauster suitable for all types of commercial and institutional buildings such as schools, hospitals, office buildings, and retail stores. 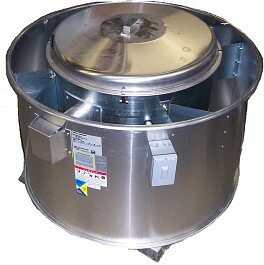 Model PDU is a direct drive centrifugal upblast exhauster designed to discharge exhaust air high above the roof surface. The PDU is available in two models: the PDU-RF for clean air exhaust applications and the PDU-RG for grease laden exhaust applications. PDU exhausters are available in nine (9) sizes ranging in capacities from 253 to 5317 CFM and up to 1 ¼ inches static pressure. Wall adapter kit is available for wall-mount applications. Model PNU is a belt drive centrifugal upblast exhauster designed to discharge exhaust air high above the roof surface. The PNU is available in three models: the PNU-RF for clean air exhaust applications, the PNU-RG for grease laden exhaust applications, and the PNU-SE for emergency smoke control systems. High pressure models PNUHP and PNUXP are available for applications with static pressures up to 4" and 5” respectively. PNU exhausters are available in thirteen (13) sizes ranging in capacities from 74 to 33,374 CFM. Wall adapter kit is available for wall mount applications up to size 245. Model DC propeller fan is offered for applications requiring large air volumes in commercial and industrial applications. Six-bladed steel propeller utilizing a cambered-twist blade design with a unique dihedral tip. Precision balanced on corrosion resistant shaft for smooth, quiet performance. Pre-lubricated bearings are used in duplex split pillow block housing. The bearings remain in perfect alignment after shipment, installation, and subsequent operation. A charcoal gray acrylic epoxy is the standard finish. All parts are iron phosphate processed for superior rust resistance and bonding of epoxy primer and acrylic epoxy top coat to the base metal. If you require a different type of Acme fan, please call us for a quote!